I am late on this last of my Black and Orange looks for October. I was worried that I wouldn't have one final outfit in me for my little experiment, but I found this sweater at Ann Taylor for $16 and I already had everything else in my closet. This is going to be a very busy weekend as we have the engagement party tomorrow, a family birthday party Sunday morning, and a friend's 40th birthday Sunday night. I got a haircut yesterday when I went to get my roots touched up. As you can see, I still don't really know what to do with my hair. Let's hope I can figure it out soon! You can see the other three looks from my Black and Orange October series by clicking the captions below. I think today's outfit was my favorite just ahead of Nautical October. Also, it was surprisingly comfortable. I LOVE this look! You look so elegant, and those shoes are GORGEOUS. 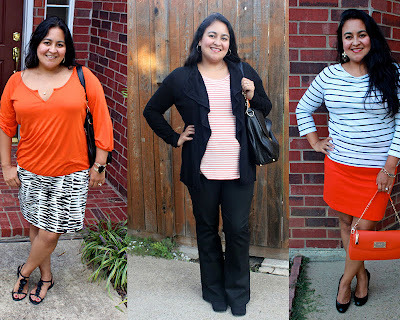 They are all great but I agree with Kimmie, the striped shirt/orange skirt look was my favorite! Thank you! 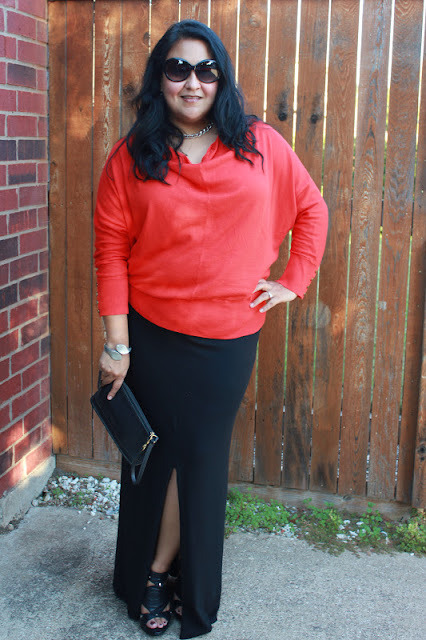 It was a little harder than I thought it would be to get four separate outfits in the theme, but I already had everything except the last sweater so I didn't have to go out and "Hemorrhage money" like my husband likes to tell me.